Summer is my favorite time of year. I know Texas is hot in the summer, but it's also peach season! And I love anything peachy, especially cobbler. My husbands favorite cobbler is any cobbler really. Apple, blackberry or peach with a layer of pastry crust on top. It's good don't get me wrong but to me that's more like a pie. My favorite way to prepare fruit cobbler is with a biscuit topping, buttery and crisp on the outside and fluffy on the inside Ummmm now that's cobbler! Today I'm sharing a recipe for this Easy Buttermilk Peach Cobbler. I usually make my regular Quick Cobbler Recipe, but I saw this recipe on Tasty Kitchen and noticed the ingredients were almost exact except buttermilk was used in place of regular milk. 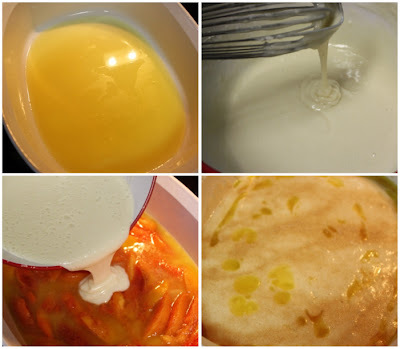 I love buttermilk especially for baking. Buttermilk makes desserts and breading light, fluffy and so delicious. I prefer to use fresh peaches when I make peach cobbler, but I have also used frozen or canned when peaches are out of season. I usually get my peaches at our local peach farm (Hams Orchard ) which is located in Terrell Texas. It's only about 30 minutes from our house, so when peaches are in season we can't get there fast enough. My husband and I come to the orchard for the peaches, but the kids come to the orchard for Ham's homemade peach and strawberry ice cream. We never leave without getting each of us a serving of that delicious ice cream because it is that good. The hardest decision is deciding on peach or strawberry so we usually end up getting a swirl so we can have a little of both. Besides the ice cream they have a wide variety of fruits and vegetables from local farmers. Strawberries, blackberries, cucumbers, tomatoes, homemade pimento cheese spread and salsas. My favorite thing is all the fresh out the oven pies, cobblers and breads. I love how they are still warm when you purchase them. My favorite is the homemade peach bread. I really need to try and recreate that recipe because it is so good. They also have all sorts of homemade canned items. Cobbler in a jar, pecan pie in a jar, fruit butters, jams, jellies, pickles and relishes. Ham's is where I purchase my moonshine syrup to make my wonderful pecan pie recipe. Umm that syrup rocks!!! They happened to be out of the syrup that particular day so I guess I will have to make another trip out to the orchard later this week. I can usually find fresh shelled peas out at the orchard as well. This particular day they had black eye peas, purple hull, lady cream peas, fresh green beans and corn. I get so excited when I see all of this stuff. I'm just as bad as a kid in a candy store. I cant help it I love fresh and homemade items. Well, I think I have talked your ear off enough about our local peach orchard. 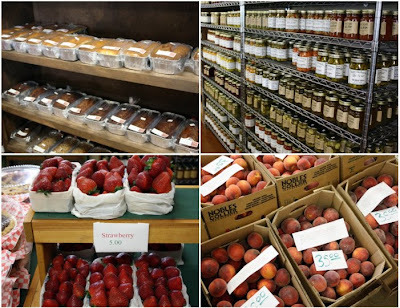 It really is a great place to visit and pick up some fresh fruits and homemade items. Do you have a favorite fruit orchard in your area? If so I would love to hear about it. Let me know in the comments section now onto the directions for this yummy buttermilk peach cobbler. To begin we need to remove the skin off of the peaches. To do this you will need to blanch the peaches first so the skin slides right off. 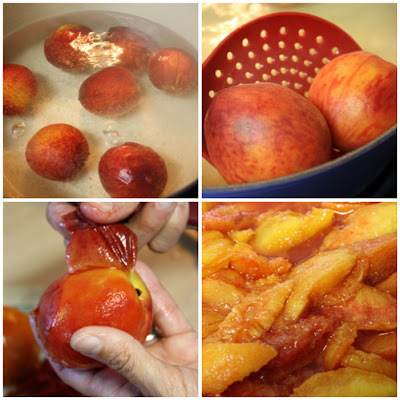 Start by boiling a pot of water, the size of the pot will depend on the number of peaches you have to prepare. Cut a notch or a X at the top of each peach the drop whole peaches into the rapidly boiling water, making sure they are completely submerged. After about 3 - 5 minutes, remove the peaches carefully with a large slotted spoon and place them directly in a large bowl of ice water. At this point the skins will slip off easily in your hands, once the peaches are cool enough to handle. You can slice and remove them from the pit. Sprinkle a bit of sugar about 1/2 cup on the peaches and set aside. Now its time to assemble the cobbler. Place a stick of butter in a 9 x 9 inch baking dish or a casserole dish of equivalent size. Place in the oven and let it melt while the oven is preheating to 350 degrees. Meanwhile, stir by hand the self-rising flour, sugar, vanilla and buttermilk. Stir it well. it will look slightly lumpy. Remove the melted butter from the oven. Place the fruit in the dish. You should completely cover the bottom of the dish with the fruit. Next, pour the batter on top of the fruit, making sure to pour it evenly around the dish. Don't forget to cover the corners. Bake at 350 degrees for 30-40 minutes or until the top is golden brown. Remove from oven and let cool a bit. Serve warm with vanilla ice cream or fresh whipping cream. After slicing sprinkle them with a bit of sugar (about 1/2 cup) and set aside. Place a stick of butter in a 9x9 inch baking dish or a casserole dish of equivalent size. Place in the oven and let the butter melt while the oven is preheating. Meanwhile, stir by hand the self-rising flour, sugar, buttermilk and vanilla extract. Stir it well, but it will look slightly lumpy. Remove the melted butter from the oven. Place your fruit in the dish. You should completely cover the bottom of the dish with the fruit. Then pour the batter on top of the fruit, making sure to pour it evenly around the dish. Don’t forget the corners! Bake for about 30-40 minutes, or until the top is a golden brown. Serve warm with vanilla ice cream or fresh whipping cream. Cook's Note: I really don't think it matters if you add the batter first or the fruit first. It's really your own preference. This is what I have been waiting on! 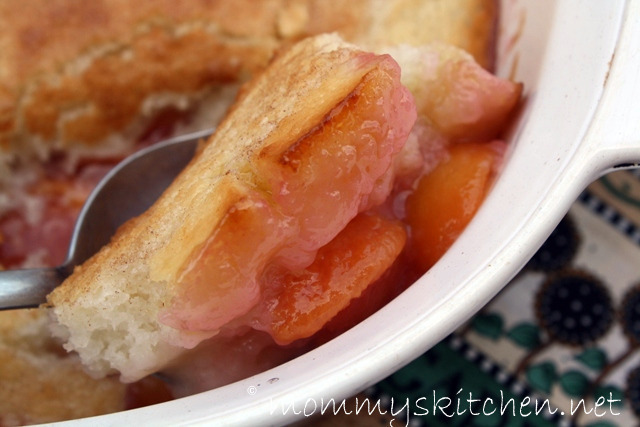 A peach cobbler that has thick dough to sop up the juices like my mama used to make. Thank you very much! So I guess I can't hop in the van and drive up to your peach joint from Houston, but I am going to try that cobbler. Yum! Oh my lands, this looks divine. The orchard store is worth the drive to Terrel alone! Fresh black eyed peas! Moonshine syrup! Local Texas produce galore! Yum yum yum! Your kids sure are cute--happy as a bug in a rug with their ice creams! Thanks for testing a Tasty Kitchen recipe-this one looks like a winner! Dessertfortwo it deserves all the exclamation points you can give it. LOL I am happy as a bug in a rug every time I visit the orchard. I am always sad when it closes for the summer. But then I get over it cause apple season begins. LOL. Hi Bill I love it when you stop by This cobbler is really good and I love the buttermilk. Heidi maybe you can find one in Houston. Do a search for local and pick your own orchards in your area. I think pickyouown.org may have something. Anything that starts with a stick of butter is my kind of dish!! Peaches are still a but pricey here for me yet but soon - can't wait. Love fresh peaches for cobbler for sure. Oh yum this looks good! We have an apple orchard not far from my house, it's called Applacres. It sounds just like the one you visit. I need to check and see if they have peaces available so I can make this dessert soon. I love peach cobbler! We went to Georgia every summer for our family reunion when I was little and always came back home with boxes of fresh peaches. I've never had any as good as those. And my Mawmaw's peach ice cream...yum! Wow, I feel like going to that Local Peach Orchard to buy those fresh strawberries. The peach cobbler looks yum! I have had this recipe for years only it's called a mountain pie and made with canned peaches but I think I like your version better. Can't wait to try it. We are thinking of taking the kids to Ham's this weekend. We've never been, but your post got me excited! We are about an hour from there. Is it worth the drive? I know the kids can pick blackberries, I think they would like that. I'm just worried about not having enough to do there for the drive. (I'm 9 months preggo and it has to be worth the trip for me right now LOL!) Although the Purple Hull Peas, and other veggies alone might be worth it. BTW tried the cobbler with some peaches off the tree in our backyard. I liked it the best hot with vanilla ice cream - yum. Do you have a post for the cobbler you mentioned using pie crust? I wish I liked peaches, but eventhough I don't, this looks really good, tina! Losingthfat, It will be fun for the kiddos. it's not a pick your own orchard. They do all the picking and sell it. I know there is a pick you own blackberry orchard in Larue Tx that is where we pick them. There is alos a PYO Strawberries In Arlington. Hams is Orchard/Famers Market. Can we say, yum! And I love the ingredient list...short and simple. Now I only need to make a trip to TX and we'll be set! So easy ... so delicious ... and so perfectly suited for a lazy summertime day. And that orchard looks like so much fun! This looks so good. 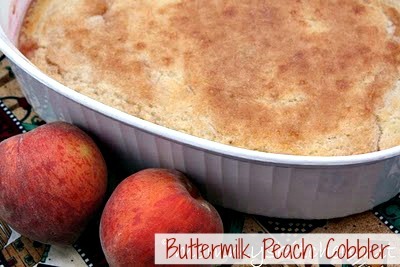 I have never tried using buttermilk when I make my Mom's peach cobbler. I just might have to! I love just about anything with strawberries in it! I am so excited to find another recipe site...I want to learn to be the cook that my mother and grandmother was with old fashioned goodness. I just made this today in honor of my Hubby's bday and it was a HUGE hit!! I have to admit, at first I was a little scared of having to blanche the peaches but it really was a breeze. This cobbler was delicious! I LoVe lOvE LOVE your recipes and the way you lay it all out for us! I have tried several recipes now and I have to say they all have been a hit. Thank you!! Hi, I found you from another blog, and I have to say we have peaches and I was looking for this recipe with no luck in my collection of recipe's. YUMM. Hi my name is Andrea, I made some of your peach cobbler, I made it exactly how you said with using fresh peaches and the topping was like rubber, not sure what I did wrong. I tried 2 different batches and still the same, let me know what I could be doing wrong. Did you use self rising flour? the recipe doesn't work with all purpose. That is the only thing I can think of. The only other thing is after you pour the batter do not stir it together. Just pour and bake. Hi Tina from Texas, It's gina from New Zealand,thanking you for your fantastic Peach Cobbler. I have been now named the family's official cobbler maker! Thank you for sharing this really yummy recipe!